As you enter the Library, don't be surprised to find a furry friend waiting for you! Stacks is a domestic long haired cat, rescued from Benld's Adopt-a-Pet shelter. 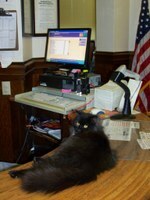 She arrived at the Library in early February, 2009, and has since become the "queen" of the Library. As you can see here, she takes her job seriously! She loves to be petted, and if you are sitting at "her" computer, don't be surprised to have her curl up on your lap. Stacks has her own donation jar -- for those queenly needs of treats, toys, and that pesky cat litter -- on the front desk. She also has her own scrapbook, to tell the story of her library days.